Mangaluru, March 24, 2016 : Science Express Climate Action special train, displaying the world of micro and macro cosmos, spreading the awareness about strengths of science in meeting global challenges, including latest discoveries and innovations in the field of modern science, will be berthed at Palakkad Junction Railway station for two days- on March 22 and 23, 2016 and at Mangaluru Junction Railway station for four days-from March 25 to 28. This train givesn an opportunity to the public, students, teachers, children and enthusiasts to understand and learn the intrinsic complexities of our climatic changes. It is a unique collaborative initiative of Department of Science & Technology, Ministry of Environment, Forest & Climate Change (MoEFCC), and Ministry of Railway, Government of India. Science Express is a unique science exhibition mounted on a 16-coach AC train. It has been travelling across India successfully for the past seven years. Flagged off on October 30, 2007 by the then Prime Minister of India, Dr. Manmohan Singh and German Chancellor Dr. Angela Merkel, the exhibition train has since then covered over 1,22,000 km across the country, receiving more than 1.33 crore visitors at its 391 halts, in 1404 days. Science Express has thus become the largest, the longest running and the most visited mobile science exhibition in India and has created six Limca Book of Records in its journey so far. The coaches of Science Express were thematically represented on the Bing Bang, Nanocosmos, Building Blocks of Life, From Gene to Organism, Architecture of Mind, World of Senses, Sensors, From Data to Knowledge, Global Challenges, Spaceship Earth, Our Home in the Cosmos and The Universe. 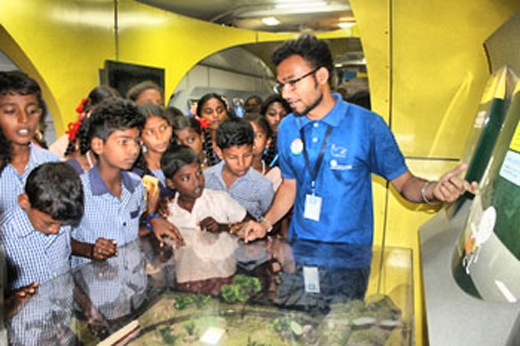 It was a retreat for the visitors specially the students to know about cutting-edge science and technology through exhibits, models and audio-visual displays put up in the coaches of Science Express. Another interesting complementary activity of Science Express is the Platform Activity. It has been designed with the purpose of better utilization of time, by engaging the students who wait for their turn to enter into the exhibition coaches. Besides, the platform provides a bigger space to cater to larger groups of students. The onboard team conducts activities dealing with different topics of Science & Mathematics in the form of games, puzzles, demonstrations, quiz etc. at the platform. Besides, even on some the important National and International days related to Science and Mathematics, like the World Ozone Day, World Environment Day etc. are also celebrated on the Platform with students and general public to generate awareness amongst the masses. In order to broaden the reach of Science Express, at each station different activities are planned in advance. Amongst all these activities, one of the most sought-after and exciting one is the Outreach Activity conducted by the onboard Science Communicators at different local schools/institutions. The outreach activities are conducted for the students who are not able to visit the train. In this program the team members of Science Express visit local institutions or schools and conduct sessions in the form of demonstrations, hands-on activities, quiz, puzzles, documentary films etc. on topics related to Science & Mathematics. At few stations depending upon the celestial events, astro-nights are also conducted, where students and local people get an opportunity to view the stellarium. 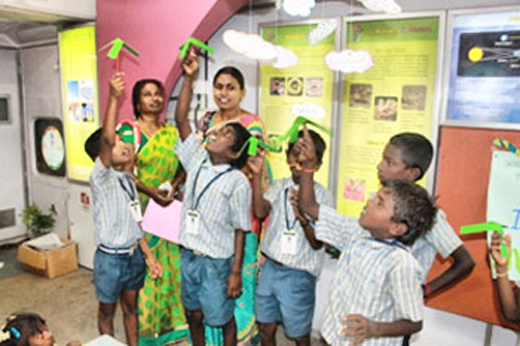 Science Express has a separate section meant for Teachers Orientation Programme, where the teachers of Primary and Secondary level are oriented for using hands-on approaches for teaching science and mathematics. It been set up and is being managed by Vikram A Sarabhai Community Science Centre (VASCSC), with the support of National Council for Science & Technology Communication (NCSTC), Department of Science & Technology, Government of India. The Kids Zone caters exclusively to younger kids up to 10 years of age. Kids visiting this section, are able to make simple models and also indulge in fun-filled activities, games and puzzles in science, mathematics and environment. These activities serve as the first step towards developing a positive attitude for formal learning of science and mathematics in future. Kids are exposed to concepts of sound, light, optical illusions, static electricity, air pressure, centre of gravity, laws of motion, balanced diet, environment conservation, numbers, etc. through activities like Hovercraft, Trumpet, Balancing Butterfly, Magic Coin Box, Toy Car, Stroboscope, Balanced Diet Pyramid, Tap-tap and many more. It been set up and managed by Vikram A Sarabhai Community Science Centre (VASCSC) and has turned out to be one of the most popular section of Science Express. Joy of Science (JOS) Lab is a unique onboard lab in the Science Express train. It been set up and being managed by Vikram A Sarabhai Community Science Centre (VASCSC), with the support of National Council for Science & Technology Communication (NCSTC), Department of Science & Technology, Government of India. It is one of the most interesting sections of the Science Express, popular amongst the school students. This hands-on-lab has six work stations, where group of 20 students (standard 6 to 10) can perform various experiments and activities for understanding different concepts of Physics, Chemistry, Biology, Mathematics and Environmental Science. School students can participate in the JOS Lab in small batches of up to 20 students, by prior registration. For registration to JOS Lab, the team aboard SECAS can be contacted on (+91) 9428405408. The children have to be taken to such exhibitions so that we provide knowledge along with watching it live. A wonderful experience to the students. Hats off to who ever provided this opportunity to the children.